My sister-in-law Julie is an incredible cook. 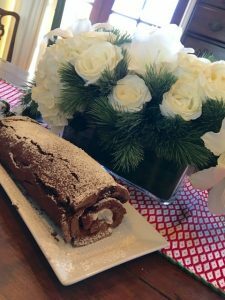 Her mother, Bette, taught her to make this chocolate roll. Bette used to make six of these every holiday season to give to her kids’ teachers. As a result of those efforts, she is probably in heaven now. If I ever meet her there. it will NOT be because I gifted educators with dessert. 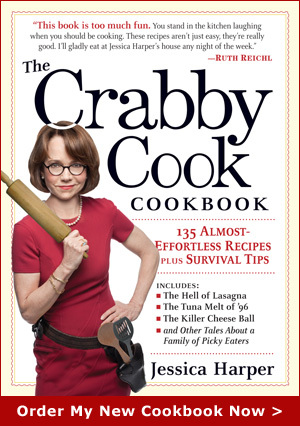 I’m too crabby to spend Christmas baking six times. BUT my husband loves this so much, it having been part of his childhood, I feel compelled to make ONE of them every Christmas. Nobody doesn’t like this. Make it for six teachers, or make it for yourself. But make it. It’s not as hard as it looks, and it is really good. Preheat oven to 350º. Grease a 10”x16” jelly roll pan. Line it with parchment paper and grease that. Melt chocolate and coffee (or water) in a double boiler or simmering water. Stir until entirely melted, then set aside to cool. Add the egg yolks to the cooled chocolate and mix until blended well. Beat the egg whites until soft peaks form. (I do this in a standing mixer but a hand mixer will do.) Gradually beat in ¼ cup of the sugar until stiff peaks form. Carefully fold the egg whites into the chocolate mixture. (Julie usually folds in a couple of spoonfuls of the chocolate stuff to the whites to get started, then adds the rest.) Pour the mixture into the prepared pan, smooth top with a spatula, and bake 15-20 minutes, until the cake is firm. When you’re ready to roll, whip the cream until soft peaks form. Add the sugar and the vanilla and whip till the peaks are stiff. Sprinkle the cocoa powder over the cake. Place a sheet of wax paper over the cake about 4” longer on each side than the pan. Flip the cake/pan over onto the counter. Remove the pan and the parchment. Spread the whipped cream over the top of the cake. Using the wax paper to help, carefully roll the cake into a log shape. If it has cracks, it’s okay. Sift the confectioner’s sugar over the rolled cake. PS I don’t know where this recipe originated. If there are copyright issues, you will have to talk to Bette. Which means you will have to go to heaven. Which means you will have to make six of these and give them to teachers. Good luck with that. This entry was posted on Wednesday, December 13th, 2017 at 9:08 pm	and is filed under Holidays, Just Desserts. You can follow any responses to this entry through the RSS 2.0 feed. You can leave a response, or trackback from your own site.